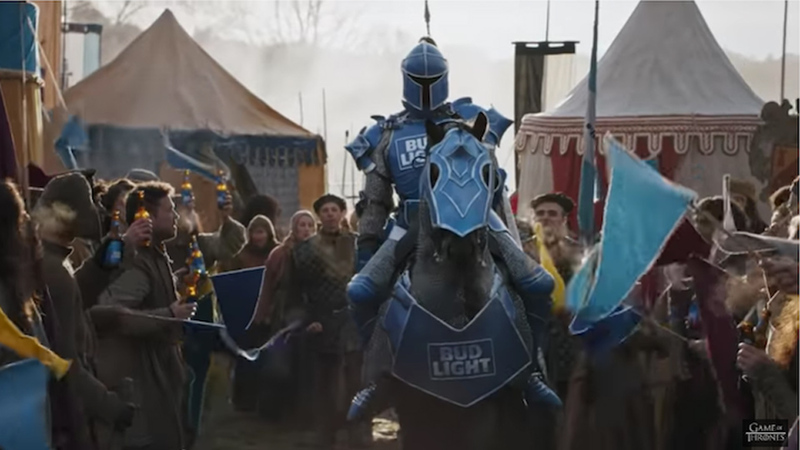 HOLLYWOOD – HBO today revealed that Game of Thrones Season 8 will contain a substantial increase in beer, but with the same calories. There’s going to be a lot more beer. Specifically, Bud Light. And by a lot I mean, it’s not just in the background or being drunk during feast seasons, I mean whole scenes are taken up with discussions about the merits of beer. There’s a character and everything. You mean like in the Superbowl ad? Yes, that’s the guy. He’s actually a character. I know. And we have bits where we see Jon Snow drinking a Heineken and everyone shouts ‘You know nothing Jon Snow’ and shame him into changing to Bud the King of (the North) Beers. Money. Game of Thrones is incredibly expensive to make and a lot of the money doesn’t come back to HBO because of piracy primarily. So they decided to be more inventive and use product placement to help raise the budget to make the show. These are long episodes as well. Are there any other products? One of the characters uses a magic tablet that has a visible Apple icon on it. And everyone eats pop tarts. That gets quite distracting. Game of Thrones returns April 14th.